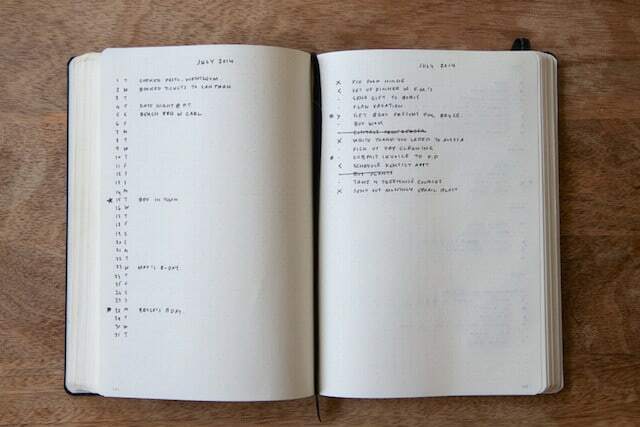 Bullet Journal (BuJo for short) is a personal productivity system invented by a product designer named Ryder Carroll. You can find a detailed introduction to BuJo on its official web site, but I can provide you the short summary here. The system lives entirely within an old-fashioned paper notebook. Each day you dedicate a page of the notebook to a daily log in which you create a bulleted list of tasks and events. As the day unfolds, you use shorthand marks to indicate a task is complete or needs to be migrated to a different day. There are some standard pages most BuJo notebooks include in addition to the daily log entries. An index at the front of the notebook is used to keep track of how the pages are being used. You grow the index as you fill the notebook. Each month also gets its own monthly overview and task list that are used to inform how you schedule individual days. And so on. A good way to think about BuJo is basically a less-rigid version of the Franklin Planner system. A lot of readers have asked me about BuJo so I thought I would share some thoughts. First, I want to emphasize what I really like about the system. Its largely unstructured use of a blank notebook is a brilliant example of low-friction freestyle productivity. In my experience, these types of systems are much more likely to persist than those that require more involved constraints. I also love BuJo’s embrace of paper as a fantastically flexible technology. A typical notebook in this system uses many different formats, conventions and notations — many of which might be custom to the individual user and change rapidly over time. This would be prohibitively difficult to implement in a digital tool. Also: notebooks don’t need batteries. My main concern, however, is that this system, as traditionally deployed, cannot keep up with the complexity and volume of demands that define many modern knowledge work jobs, where the sheer volume of tasks you must juggle, or calendar events in a typical week, might overwhelm any attempt to exist entirely within a world of concise and neatly transcribed notebook pages. With this in mind, I’ve been brainstorming recently about how one might upgrade the rules of BuJo to better handle these unique demands, while still keeping the features I really like about the original framework — creating, for lack of a better term, a BuJoPro system. Maintain a deep work tally. Once you’re time blocking every day, it’s easy to use BuJo-style shorthand to track deep work hours. I recommend circling each hour in your daily plan during which you maintained unbroken concentration on a demanding task. When summarizing your week or month it’s then easy to quickly tabulate how many of your work hours were spent in a state of depth — a compelling scoreboard that helps ensure you’re producing value, and not just reacting to demands. Augment the notebook with a calendar and master task list. The beauty of BuJo is that it exists within a single self-contained notebook. This feature, however, can also be a fatal flaw. Many knowledge workers unavoidably fragment their week with dozens of shifting appointments and meetings. There’s no way to manage this easily in a paper notebook — it’s simply much more effective to use a digital calendar. Similarly, as David Allen famously argues, many modern professionals must keep track of hundreds of professional tasks. These cannot effectively exist in a paper notebook on a monthly task list — it’s simply more effective to maintain a digital list. In BuJoPro, therefore, you should reference a digital calendar and master task list each week when creating your weekly plan. As your week unfolds, you can then mainly live within your analog notebook. Integrate email. Probably the biggest omission from BuJo in the professional setting is that it ignores the (unfortunate) reality that most knowledge workers drive their work day by sending and receiving emails. There must be, therefore, a considerate process for interfacing between an email inbox and paper notebook. In BuJoPro, the digital calendar and master task list can mediate between these two worlds. That is, as you check your inbox, you can add new events or deadlines to your calendar, and new tasks to your master task list. Because you check your calendar and master list during the weekly planning process, these updates will integrate into your paper scheduling as needed. If something pops up in your inbox that impacts the current week, you can directly modify the current weekly and/or daily log as needed to integrate the change. Caveat emptor: I haven’t field tested BuJoPro. The above ideas are merely speculation on how one might maintain all the things I love about the self-contained analog simplicity of BuJo, while successfully tackling the annoying challenges unique to our current hyper-connected world. Wow I can’t believe you totally read my mind. Cal, I have been using the BuJoPro for the past 2 years, with EVERY single upgrade that you suggested. I didn’t start my bullet journal like that. However, my specific needs required me to naturally change the way I use my BuJo. The product of 2 years of natural upgrades is what you exactly describe in your post. Indeed, the traditional BuJo is not sufficient to handle the demands of a busy work life (a student life for me). I can tell you that the BuJoPro works fantastically and that I essentially revolve my life around it. I also noticed that many other students use the BuJo, but not the BuJoPro, which is why I think so many of those students still miss deadlines and tasks and end up throwing the journal away. I do pretty much exactly what you describe with a combination of a paper planner (weekly and daily), notebook, and Trello so I can confirm that BuJoPro works for me! Buljopro sounds a lot like the old “Daytimer” sytstem which worked wonderfully for myself for years before getting lost in the new frontier of the digital age. Bullet Journals are like Daytimer or Franklin Planner products, except you format the pages yourself on the fly, as oppose to having them pre-formatted — allowing more flexibility, etc. Went from Franklin Planner to at-a-glances classic “Standard Diary”. A book bound day per page year of mostly blank lined pages. I love it and feel more in control. I get things done. Also, I have a large monthly planner to Look ahead at the year. So happy to see that this idea works for others and very appreciative of this post and the links. Thanks so much CAL! Yes, this system definitely works! I’m a full time author who’s working on multiple projects at any one time — I need lots of deep work time to actually write, but I also deal with a constant stream of publicity and admin requests from various publishers, which come in at unpredictable times and so mimic the sort of workflow I used to experience in an office job. I do almost exactly what you describe here, and this system has transformed not just my productivity but my stress levels — and freed up so much more time for deep work! In fact, I developed this system after reading Deep Work, so it’s definitely a natural progression from the ideas and steps you discuss there. If you ever work on developing this further in the future, I’m happy to provide any info that might assist. Amie, what do you use for your master task list? Maybe Cal can also jump in here, because I’m struggling with the GTD setup ingrained in me over the last several years and integrating or replacing it with a master task list. Is that supposed to be without contexts (e.g. @home)? But Amie, I’d like to know what apps you use and links to pics of your setup would be great too, if you don’t mind. Any reason *not* to assign GTD-style contexts to your tasks? I keep a right-hand column open in my daily / weekly list into which I at the conetext (@home, @work, @shop) being typical. I also combine both technology and paper, especially MS Outlook. We are very MS Outlook intensive at work so for scheduling and blocking time for deep work is perfect since nobody will request a meeting during a blocked period. The BuJo then is a tool to track and capture tasks. I also use the weekly plan and those tasks that have a specific date assigned are highlighted both in BuJo and MS Outlook. I use BuJo to capture everything work-related (customer visits, minutes from meeting, phone calls, etc). It is a journal after all. Thanks for this post. It seems to confirm that this strategy works. While you haven’t had an opportunity to field test your BuJoPro theory, there are many who have. There was a BuJoPro blog and Facebook group that changed their name due to trademark laws, but are still actively exchanging these ideas. There are a lot of hacks for scheduling, time blocking, meeting notes, delegation, and more. Dot journaling is built of flexibility and can work for the Pro. Anyone has tried to implement digitally concepts of BujoPro? I think that putting together a digital Pen (iPad PRO or Surface), a tablet (or Tablet PC) you could have all in a single application (that at moment doesn’t exist). Are you using this system now or still using your daily planning method using the Red & Black notebooks at you have posted about? As of today, I’m still using Black n’ Red’s: but I think I’m going to give something like BoJuPro a try in the New Year. In particular, I don’t like that I have weekly plans, as well as temporary plans, existing in different mediums than my daily plan. I would like try to keep all that in a single notebook. So I might give that combine notebook approach a try. I still find a lot of the details of standard BuJo way understrength for the type of high intensity knowledge work I do (which generates intricate and shifting calendar demands; massive and mutating task lists; and hundreds and hundreds of pages of notes that can’t be contained by the occasional page put aside in a 5×8 bullet journal). I follow all of these steps as well. I tried the Bullet Journal after applying the Deep Work scheme and had to drop the BuJo. One additional difference is that I am currently experimenting with a modular notebook (Levenger Circa–I didn’t like the Staple Arc) so I can keep project-specific notes in one place. I really didn’t think the index system worked for me. I’m using Samsung Note 5. I also designed my formats for weekly daily and monthly schedules as note backgrounds, in that way I can use digital pen write/revise on them easily and the formats persists. Perhaps you could implement the whole thing on a tablet using a Wiki. It’s free-form and allows links to fresh, unformatted pages. Thanks for sharing the post. It’s very creative and helpful for now-a-days generation & also it saves time. Any suggestions for master task lists? I’ve developed a trust in OmniFocus because of its ubiquitous capture, but find I don’t need all the other bells and whistles. When I’ve tried out things like plain text or Google Docs, I a) lose faith in my ability to capture or b) don’t trust the system to capture deadlines the way OmniFocus does. Lots of systems that incorporate all the good points in different ways. I use the moleskin calendar / notebook book. On the left page is the weekly cal, on the right page is a lined note page. I write my tasks – BuJo style on the note page and then use the cal page to block out time. I found that BuJo alone was too free form for me. I also use google cal for appointments and Evernote for bigger planning stuff – like planning out a course I am prepping. I’ve just got a bujo and am looking forward to using it. A weekly spread is a must for me, looking forward to playing around with formats. I’m thinking I’ll allocate time blocks by just noting a time next to each task, rather than calendar style. I’ve done something similar. The beauty of the the BuJo is its flexibility and I made it really flex for me! I use it as is during the summer but during the semesters I actually create weekly daily spreads for the whole semester (using in part barn door pages) because I need to nap out class times, grading times meeting times so I can plan when assignments will be due based on other activities. While it’s time consuming – it takes me a few hours twice a year and works great. I also am one who’s developed this system, and it works really well for me. I use a traveler’s notebook — it’s a leather cover with elastic straps inside, on which you slip a small, paperbound notebook insert. Mine holds four inserts, and I use one for weekly plans and short-term project plans, one for daily logs (including a plan for time use and an actual time use for each day), one for long-term master lists (books to read, longer-than-a-month projects, that kind of thing), and one for taking notes on books I’m reading. You could do the same thing with any other planner and use dividers; I just like the traveler’s notebook look and being able to change out one section when it’s full without having to change all the sections. I love using paper planners as a mindset/goals oriented tool. What are the 3 things I must get done to best advance my work? I find that shift helps me to then allocate time (even if it means closing email) so I don’t fail to meet my planner goals. I have not yet adopted this idea of organization through a notebook, but considering that my busy schedule is lacking much organization, I really feel like a BuJo would be very beneficial. I like the idea that it is more freestyle and less constricting. I am worried though that with my high involvement in the digital world, if I will be able to maintain both at the same time or if it will just be another additive that isn’t really helping my issue. Totally going to try this out though, thanks! why waste time with paper? I prefer the cadence of pen and paper journaling but, the advantages of digital can’t be ignored. I would like to see more compatibility with iPad Pro or the Remarkable tablet. Integrating the best of both worlds. A BuJo app that integrates with digital project management systems is long overdue.